Wine cellar refrigeration systems may be simple or complex, forced air or split-type, and affordable or expensive. These units vary significantly on the amount of noise produced (decibel level), how they vent, installation method, and lifespan. One of the three general types of wine cellar refrigeration systems Los Angeles is the forced air type, also known as the through-the-wall wine cellar cooling system. This basic style of wine cellar refrigeration is like a window-type air conditioner, but the forced-air cooling unit cannot vent air out. It can only vent interiorly, into an adjacent room that should be bigger than its maximum cooling capacity (80 degrees Fahrenheit). One of the advantages of this cooling unit type is its affordable price and simple installation method. However, a forced-air cooling unit only lasts up to 8 years, and it is quite noisy. This wine cellar refrigeration type offers high functionality. It is somewhat similar to the forced-air type, because they both have their compressors and evaporators in a single housing. On the other hand, a ductable unit gives you the convenience of positioning it in a separate room, far from your custom wine cellar. You can then duct the cooled air into your wine storage room while releasing the warmed air to outside. In fact, some units can even be placed outside of your house, as long as you protect the unit from environmental factors. Ductable wine cellar refrigeration also gives you the convenience of a quieter wine storage space, because of its lower decibel level compared to forced-air units. It also has a longer shelf-life of up to 15 years. 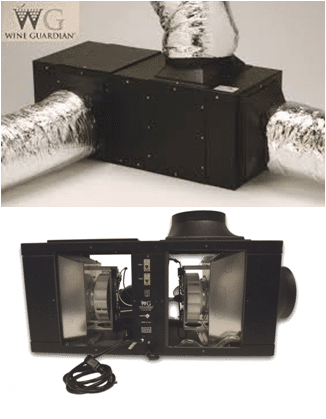 With its higher functionality and lifespan, it is a bit pricey; and, on the downside, the ducts can only run a maximum of 25 feet, and you have to make sure that warm air is vented away from any living space. The third type of cooling system is the split-type. This type has two configurations – ductless or ducted. The former is more common, because its installation is simpler. It is like a centralized air conditioning setup with a separate condenser that can be placed in a separate room or outside the wine cellar. A pair of refrigeration pipes that would normally hang on your wine cellar walls connect the condenser to the evaporator. A ducted setup, on the other hand, is ducted into the wine storage; but, this is only needed if your wine cellar is large. Split-type units are very advantageous. Their evaporators are very quiet, because the fans are the only parts producing a sound, and their condenser is located somewhere else. Also, its refrigeration lines can run as long as 90 feet, giving you a wide range of installation options. Additionally, split wine cellar refrigeration systems last up to 20 years and can give you constant temperature and relative humidity levels which allows your wines to age safely. For its downside, a split-type unit is costly. This is due to the fact that its refrigeration lines need to be charged with a refrigerant. You would need the HVAC expertise of a wine cellar specialist. Ultimately, a lot of factors need to be considered for your final decision. This includes the storage room size, venting application, your budget and location, just to name a few. 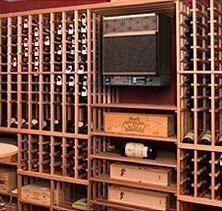 Make sure that you talk to wine cellar refrigeration systems Los Angeles expert before making the final decision. 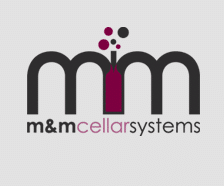 M&M Cellar Systems has the best customer service and installation and maintenance skills for your wine cellar refrigeration. 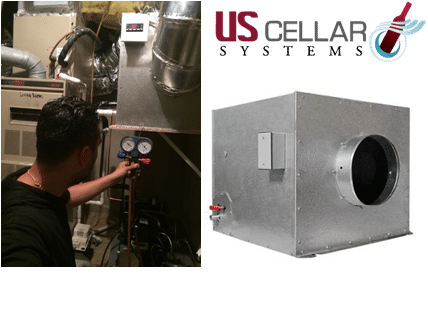 It is a family-owned business based in Los Angeles with years of experience in HVAC refrigeration and heating installation and services. You can contact them through their website www.winecellarcoolinglosangeles.com.